With summer right around the corner, soup is out and cold side dishes are in! This Keto Broccoli Salad is one of my favorite ways to take a boring low carb vegetable, broccoli, to the next level with minimal effort. A quick blanch and some mix-ins and you've got the next best summer cook out side dish! Watch me make it below. Why, yes! Broccoli is one of the vegetables lowest in carbs and net carbs. Broccoli has fiber that can be subtracted, which makes it a great option for side dishes and veggie lovers. One cup (91g) of broccoli has 6 total carbs and 2.5 fiber bringing it to a total of 3.5 net carbs. Not bad, for a heart, filling vegetable! We love to steam it and top it with butter or roast it in the oven at 300 degrees for 15 minutes if we are looking for a quick side dish to pair with a steak or burger. 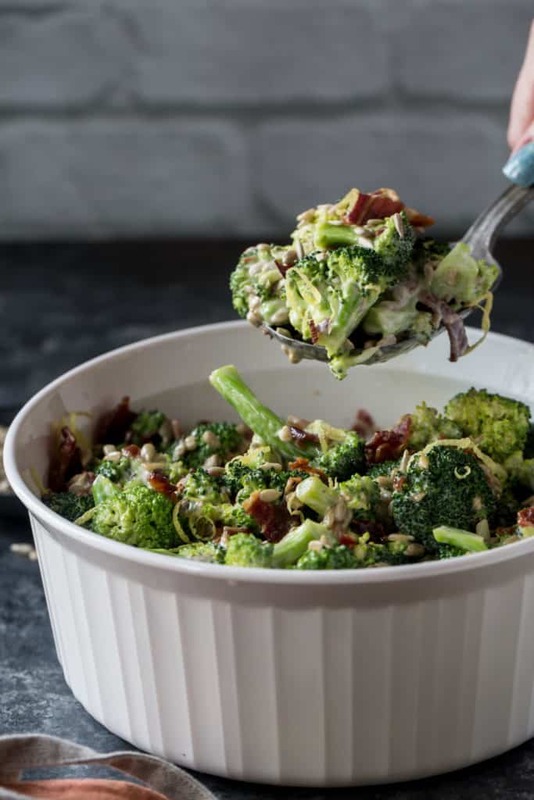 However, this keto broccoli salad is my favorite preparation - creamy mayo, crunchy bacon and the bright colors bring this side this to life! Keto Side Dishes Are Easy To Come By! Let us know if you give any of the above a try by leaving us a comment below - we'd love to hear what you think! Keto Broccoli Salad For Summer Time Grilling! In Matt's mind this recipe is confined to the outdoors and only when the grill is going, but he's not so open minded when it comes to food hehe. Since creating this recipe I've recreated it with slivered almonds and diced red onion and stored in in the fridge for mid day snack or side dish for dinner. 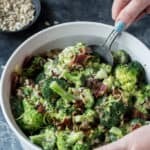 Pregnant Megha loves this Keto Broccoli Salad and she bets you will too! 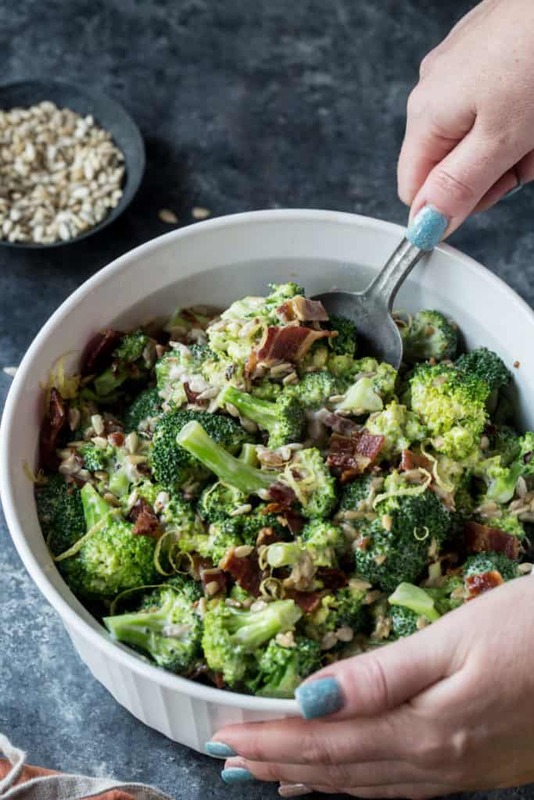 Recipe can be quickly added to MyFitnessPal - Search "KetoConnect - Keto Broccoli Salad"
Blanch the broccoli in boiling water for 1 minute. Drain and rinse with cold water. In a large bowl mix together mayonnaise, vinegar and lemon juice. Stir well. Add broccoli, bacon, seeds to a large bowl. Drizzle with desired amount of sauce. Refrigerate for at least 1 hour before serving. Toss again to coat before serving. Store in the fridge for up to 2 days.